Welcome to Christmas! Does it seem to you like this year has flown by!? I blinked and it happened. So… I have a huge pile of interviews, reviews, and giveaways that have been waiting (and waiting and waiting and waiting) for me to get around to posting them for you. I am very happy to introduce you to a few more of my very favorite artists. Desiree Habicht is a multi talented artist working in both cloth and watercolors – and probably other media that I haven’t seen yet. We had a great (email) interview months ago and she has been patiently waiting for me to get around to putting this up. I know you are going to love her art as much as I do! Lyric: Did you always want to be an artist. Desiree: Yes, I can say I have always been an artist. My mom often reminds me how I was always making books and cards for people as a small child. They were always fully illustrated too! Everything was fair game and I often sketched on whatever I had close, math homework etc. I was born to create. Desiree: I am a self taught artist and was fortunate to have worked with interior designers, professionals and builders doing faux finishes and murals along with my fine art. I worked for years, and as my children got older I was able to travel all over to paint on site . At the point of being almost empty nesters everything changed. In 2000 our daughter was hit by a drunk driver. After 8 months of hospitals and life support we brought our daughter home. She required full time care and all of our lives were forever changed. I was now at home figuring out my new life and saw the TV show “Simply Quilts”. As I watched I was thinking I could do that at home. 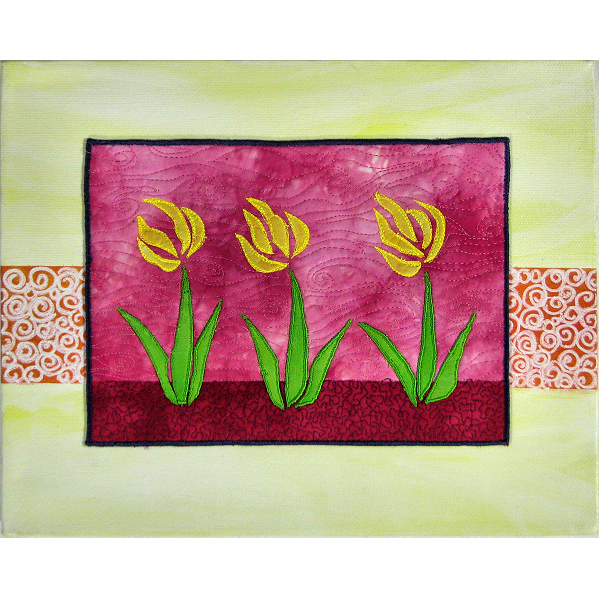 I started with one quilt class, one night a week and quickly moved into designing my own patterns and art quilts. That led to the opportunity to design fabric which I love. 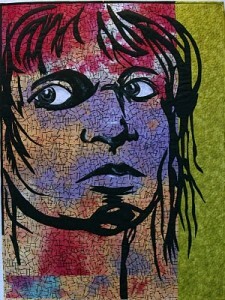 Art is a gift and allowed me to reinvent myself so I could care for Jennifer and still create and work from home. Art is a never ending journey. Desiree: I love textiles, the feel, the ability to create art from fabric and to create fabric from my art! Quilts symbolize comfort and warmth which they provided me in many ways. My art quilts allow me to tell a story or share an event with my viewers. I love putting in hidden elements and symbolism that mean something to me. Textiles also opened up a whole new group of friends and colleagues which I am so thankful for! Lyric: Whats coming up that you would like me to share? Desiree: Right now I have some of my quilts in a book available at Amazon called “Cutting Edge Art Quilts” by Mary Kerr. I also just self published my first pattern book that goes with my latest fabric line ” Gumdrops and Lollipops”. I also have a new fabric line coming out called ” Monster Trucks” which will be sold by Quilting Treasures and will be available at your local quilt shop. Lyric: Is there anything else you want me to tell my readers. 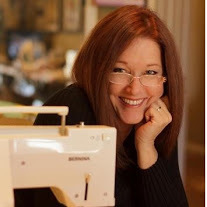 Desiree: Yes, I want to encourage everyone that no matter what your facing you are not alone and art, quilting, and creating can be both therapeutic and healing. 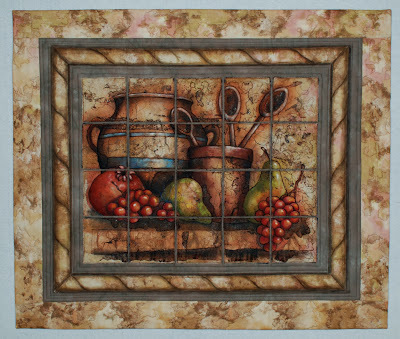 Desiree’s patterns, art quilts, art work and workshops can be viewed on my website www.desireesdesigns.com. She sends out a monthly newsletter with upcoming giveaways, classes and shows, that you can sign up for on her website. 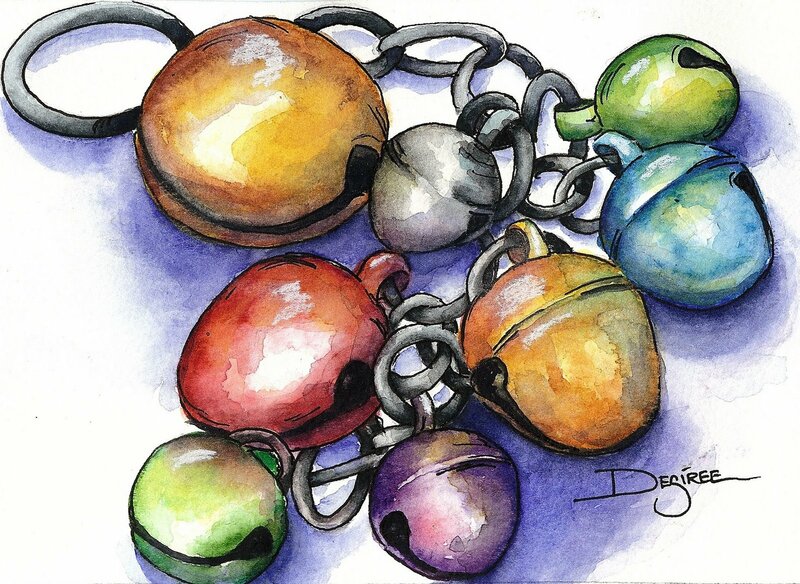 You can also follow Desiree’s blog, http://myclothesline.blogspot.com, and see her monthly contribution to The Sketchbook Challenge blog that both of us contribute to along with some other amazing artists! And now – the first of many giveaways over the next few weeks. 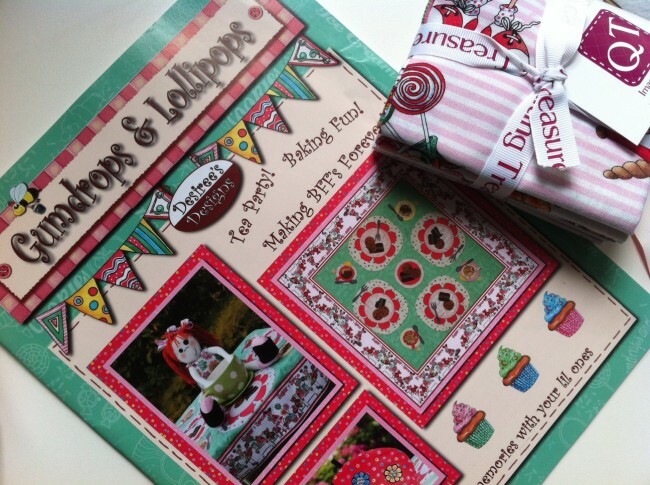 Desiree graciously shared a sweet little bundle of her fabric and the pattern book to go with it. If you have any little sweetlings in your life you are going to love this giveaway. If you are anything like me it won’t get done in time for Christmas but I think these are perfect for valentines day! Leave a comment below – telling me now your art helps you through the rough times. My Mom taught me how to sew, knit, crochet and many more crafts and I’m so thankful that I had that creative beginning. I find being able to create something with my hands, takes my mind to a happy place. Thanks for a great interview, it was nice to learn about Desiree and her work. Her book and fabric look awesome, fingers crossed, hehe. Thank you and Desiree for a super giveaway and a chance to win. I can become totally lost in my work, especially when I’m free motion quilting. The hum of the machine blocks out background noises and allows me to relax and enjoy the creative process. When I stop to take a breather, I feel calm and refreshed and ready to take on any new challenges. Creating has always been a driving force in my life. Creating allows a whole new perspective, or feeling, through outward expression. It changes the way my brain thinks. Whether the hard times are loss or stress or simply the need to relax art provides a structure and focus–you are doing art and focused on the processor the project. It gives my brain a break from the “stuff” in my life and allows me to slow down. I find am better able to focus on what needs to be done when I have spent time with art–glass, fabric, paint or plants… it all centers me and restores my spirit. Handwork provides something to do while waiting. I amazed my dear mother when I learned to quilt. Even though by then he sight was almost non existent she could make out a design, or vibrant colours. She loved to tell others in the nursing home that her daughter made the quilt on her bed, or the wall hanging in her room. She had gone to boarding school and all the nuns taught was how to mend things and embroidery. A sewing machine was not part of my growing up. My dad died the year I learned to quilt. Then the next several years I spent being my mothers eyes and ears and often her sounding board. Quilting was my great escape. Like nothing else in my life it has given me the opportunity to express my self and confidence to try and sometimes succeed. Now I am stretching my abilities and learning new things. Couching and beading have found their way into my quilts. I wish I could show everyone who suffers from loneliness, depression or stress how to quilt. It is the best way to be calm, busy and gives you a feel good feeling. Sorry for the book…I was a writer before I discovered quilt. Thanks for the great interview with Desiree. I always enjoy the kindred spirit of other creative souls. Making things has always been a passion. And even if I don’t want to make them, I love knowing how they are made. Some things, I do only once and I am satisfied. Other creative things become passions. I forgot the “rough times” part. When my Mom was in the hospital ICU, not expected to live, drawing became my escape and comfort. I would sit and draw anything in the waiting room that was still long enough. In that process I drew a sketch of Dad, that later I translated into a monochromatic painting/sketch. Mom survived and is still with me, Dad however is gone – but his essence is captured in the painting. So creativity was a double blessing. At my age (78), if I didn’t have some ability to create, be it painting, crafts, quilting or writing , I feel I would just waste away. Every morning I wake up, thanking God, then thinking of the next project I can do. My creativity began when I retired, children grown, empty best began. The wonderful thing about creating is that it puts you in the “now” so that while we are grieving we are also celebrating life because creating is giving birth. I just recovered from a long time depression. My first steps out begun when I started my creative blog. I was always creative but during the depression I lost my ability to create totally. After a treatment at a health resort I started creating again. It is definitely a healing way! Thank you for sharing a bit of your story – it is encouraging to me. Longer feeling creative I met several new creative friends. Desiree being one of them. I now find my creative spirit when I am remembering how important my quilts and art work were to my mother. She is still a major part of my inspiration. Thanks so much Lyric, so nice to be the featured artist!